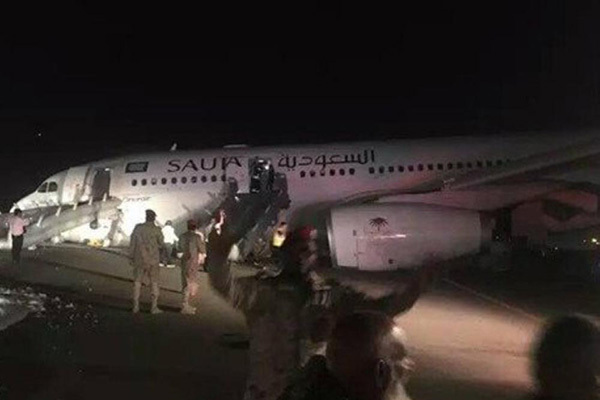 A Saudi Arabian Airlines (Saudia) flight travelling from Madinah to Dhaka, Bangladesh, was forced to make an emergency in Jeddah last night after suffering a malfunction of the nose landing gear, said a report. Flight SV3818, which was carrying 141 passengers and 10 crew members, was diverted to the Jedah airport for an emergency landing after a defect in the hydraulic system was noticed. The pilot was forced to land with the nose gear retracted, said a report in Saudi Gazette. The plane suffered considerable damage but passengers were evacuated via emergency slides. Medical teams at the airport treated 70 passengers while four others were taken to the health center, according to reports. The concerned authorities have started a probe into the accident, the report said.